NPC Headliners Book Event: Dan Kennedy, "The Return of the Moguls"
With the proliferation of high-speed broadband internet over the last half-century, reporters at major daily and weekly newspapers in cities and communities all over America found themselves writing the obits for their own print publications. Unable to retain readership and therefore unable to rake in revenue from advertisers, print publications became increasingly unprofitable and unattractive to potential investors. But then something strange happened – a new generation of media moguls with deep pockets decided to buy-in to the newspaper business. 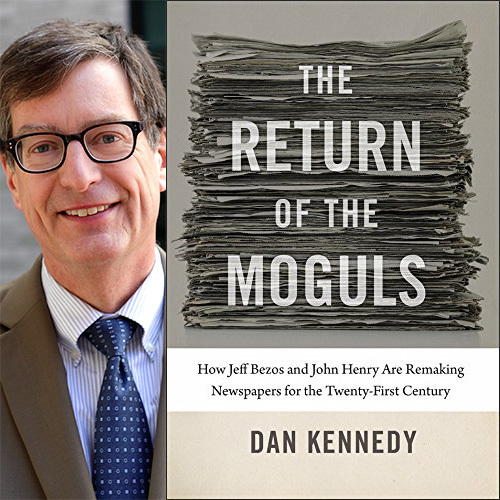 Dan Kennedy, author of “The Return of the Moguls: How Jeff Bezos and John Henry Are Remaking Newspapers for the Twenty-First Century” will explain how this new crop of business-minded press barons have the power to reshape the industry and democracy itself at a National Press Club Headliners Book Event on Wednesday, June 13 at 6:30 p.m. in the club’s conference rooms. Dan Kennedy is an associate professor of journalism at Northeastern University in Boston. He is a nationally known media commentator who appears regularly as a panelist on “Beat the Press,” a weekly media roundtable on PBS’s Boston affiliate WGBH-TV, and writes frequently for WGBHNews.org and Harvard’s Nieman Journalism Lab.